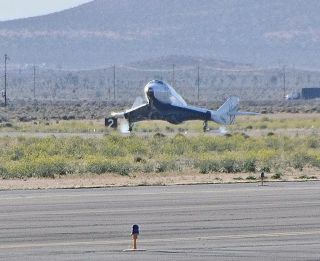 After its fifth glide test flight – the longest one yet – Virgin Galactic's first SpaceShipTwo passenger spaceship touches down on a runway at the Mojave Air and Space Port in California on April 22, 2011. A privately built spaceship built by the space tourism company Virgin Galactic soared through its longest flight yet today (April 22) during a drop test over California's Mojave Desert. Photojournalist Bill Deaver snapped this photo of Virgin Galactic's first SpaceShipTwo spaceliner on the runway after its fifth glide test flight on April 22, 2011 at the Mojave Air and Space Port in California. The suborbital Virgin Galactic spacecraft, called SpaceShipTwo, maneuvered through the skies over the Mojave Air and Space Port during the milestone test. The Mojave-based aerospace company Scaled Composites is overseeing construction and flight testing of SpaceShipTwo and its WhiteKnightTwo carrier plane for Virgin Galactic. "Looks like another good day for the Scaled team as we move through the test program," said George Whitesides, president and CEO of Virgin Galactic. Whitesides told SPACE.com that the flight was the longest SpaceShipTwo glide flight to date. Test pilot Peter Siebold and co-pilot Doug Shane, who is the president of Scaled Composites, flew SpaceShipTwo during the test, which lasted 14 minutes and 31 seconds, said Christine Choi, a spokeswoman for Virgin Galactic. The glide tests typically have a checklist of items that range from evaluating stability and control of SpaceShipTwo to maintaining pilot proficiency. SpaceShipTwo spacecraft are designed to carry six passengers and two pilots to the edge of space and back. The flights are expected to offer a spectacular view of the Earth and several minutes of weightlessness, Virgin Galactic officials have said.Tickets for the flights cost $200,000 per seat. Virgin Galactic's SpaceShipTwo passenger spacecraft and its WhiteKnightTwo carrier plane are seen flying with the moon below during an April 22, 2011 glide test over the Mojave Air and Space Port in California. SpaceShipTwo has been put through an ever-expanding set of flight objectives, starting with its maiden free-flight on Oct. 10, 2010; a second glide test on Oct. 28; a third drop test on Nov. 17; and a fourth glide test earlier this year on Jan. 13. Shortly after tarmac touchdown, a debriefing was held involving personnel involved in the glide flight. More tests of the SpaceShipTwo are expected as part of a dedicated campaign to ready the craft for commercial operations. A major milestone still to come are the SpaceShipTwo tests involving short, medium and long blasts from the spacecraft's hybrid rocket motor. Last month, a sixth full-scale flight design rocket motor hot-fire was performed using ground test facilities. Reportedly, all objectives were completed, such as evaluating igniter performance, nozzle ablation and monitoring the stability of the burn. At New Mexico’s Spaceport America, the planned home port of Virgin Galactic's SpaceShipTwo fleet for suborbital space tourist flights, work is nearing completion on the facility's Terminal Hangar. Meanwhile, construction of New Mexico's Spaceport America -- billed as the world's first purpose-built commercial spaceport -- is nearing completion. This site will support Virgin Galactic's commercial space business of flying passengers into space. Once fully operational, Spaceport America will handle both vertical and horizontal launch vehicles. In February, the Spaceport Authority Board of Directors announced that Christine Anderson has become Spaceport's executive director. Among several past military and civil positions, she was the founding director of the Space Vehicles Directorate at the Air Force Research Laboratory, Kirtland Air Force Base in New Mexico. Virgin Galactic's VSS Enterprise test flight program is slated to continue through 2011, prior to commercial operations, which will be based at Virgin Galactic's future headquarters at Spaceport America in New Mexico.